The greatest benefit of the PCG Home Décor Collection of Bamboo Cutting Boards with Glass Serving Tray is your ability to create long term marketing exposure, while giving your client a useful, personalized gift that keeps your name and contact information in front of them on a regular basis. The combination of a useful and personalized gift creates that long term "Stickiness" that provides optimal return on your marketing dollars. Additional benefits of our Bamboo Cutting Boards with Glass Serving Tray include a unique 2 in 1 product design that lets you cut on the bamboo board and serve your food on the glass serving tray. In addition, the tempered glass serving tray can have any one our 20 unique Home Décor designs or YOUR CUSTOM PHOTO permanently embossed on the reverse side. Or, you can choose a clear tempered glass serving tray and have a beautiful laser etched monogram engraved into the bamboo board. No matter which personalization style (full color or laser etch) you choose, each unique gift is "personalized" with your clients' name, while also creatively displaying your "personalized" marketing message and signature line. The Glass Serving Trays are made from Tempered Glass and are 100% dishwasher safe. The Bamboo Cutting Board should be treated periodically with mineral oils and washed by hand. Remember, by making it "PERSONAL" and "USEFULL" you are giving a gift that lasts a lifetime. Why The Perfect Closing Gift? The success of a promotional item is based on how often a client or potential client looks at, uses, or remembers who gave the item to them. The PCG Home Decor Bamboo Cutting Boards with Glass Serving Tray fulfill all three of these requirements. First, the Bamboo Cutting Boards with Glass Serving Tray are used in the most important rooms of any house, the kitchen and family room. Second, the Home Decor line is 100 % useful and can be used in everyday food preparation and serving. Finally, the "Personalization" of your clients name along with your thank you message always reminds them of who you are and the service you have provided for them. Remember, flowers wilt, wine is consumed, and gift cards are used but The Perfect Closing Gift will be there at your client's fingertips day after day after day. 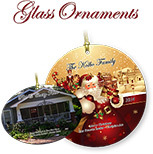 Your "personalized" gift is perfect for any homeowner, business client, or friend. How is the Perfect Closing Gift Personalized for You....And Your Customer? Personalized for Your Customer: The PCG Home Decor products allow you to distinctively add your clients name to all of our 20 designs as well as Your Custom Photo. Each design takes advantage of a prominent area and displays the clients name any way you want to. Either in a formal or informal fashion. And You: The PCG cutting boards have a unique "soft spot" on each cutting board design that creatively displays your custom message and signature line. What is Charter Membership and How do I order my cutting boards or coasters ONLINE - One unit at a time? The "Charter Membership" is Your Online Order page that allows you to redeem your inventoried Bamboo Cutting Boards with Glass Serving Tray one at a time. Your online order page is accessed with your personalized Username & Password via our PCG web site. Your Custom Online Order page lets you customize any one of our Home Decor designs with your clients name and your personalized message and signature line. In addition, you can check your inventory quantity, track past orders, and select where you want the cutting boards or coasters shipped. Either to you, or direct to your client. What is Charter Membership - The "Charter Membership" grants you access to Your Online Order page. Username & Password protected this Personalized online page allows you to redeem your inventoried Welcome Door Mats or other PCG products one at a time. How long is my inventory good for? The initial purchase of any PCG product has an inventory life of 18 months from the date of payment. An Inventory Maintenance Fee (IMF) will be charged to reactivate your account for any unused inventory after the initial 18 month period. If you opt to reactivate your account and extend the life of your inventory the Inventory Maintenance Fee is $25.00 per year. $25.00 will be charged for every year that the inventory remaines idle. If you add additional closing gifts to your account, the 18 month inventory expiration we restart on the date of the new transaction. Inventory Maintenance Fee subject to change without notice. How do I order my Perfect Closing Gift products ONLINE - One unit at a time? Your online order page is accessed with your personalized Username & Password via our PCG web site. Your Custom Online Order page lets you customize any one of our Welcome Door Mat designs with your clients Last Name, Initials, or Single Letter. In addition, you can check your inventory quantity, track past orders, and select where you want the Welcome Door Mat shipped. Either to you, or direct to your client. Do we offer bulk shipping?